Inspired by cultural images of ballerina tutus, the garb of fairy-tale princesses and Barbie doll couture, Cathy Daley’s work investigates childhood memories of what it means to be female in Western culture, all the while exploring the cultural representation of the feminine and the body. Her drawings mine contemporary vocabularies of glamour, fashion, popular culture, Hollywood cinema, fairy tales, and mythology, as a means of examining the iconography of the feminine as it exists in cultural imagery, personal memory, and fantasy. 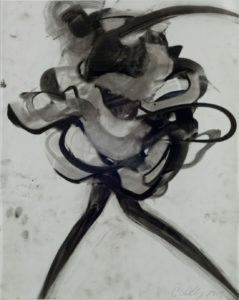 Daley has exhibited her work nationally and internationally, including shows at The Power Plant (Toronto), The Museum of Contemporary Canadian Art (Toronto), The Saidye Bronfman Centre (Montreal), The Southern Alberta Art Gallery (Lethbridge) and the Museum Dhondt-Dhaenens in Belgium. Her work is in the collection of the National Gallery of Canada and the Art Gallery of Ontario, as well as numerous other public institutions and private collections. She has been featured in Art in America, Border Crossingsand Canadian Art Magazine, and has received awards from the Canada Council for the Arts, the Ontario Arts Council, the Toronto Arts Council and the Bertolt Brecht Fund of Berlin. She is an Associate Professor at OCAD University, and is represented by Zweigstelle, Berlin and Newzones Gallery of Contemporary Art, Calgary.